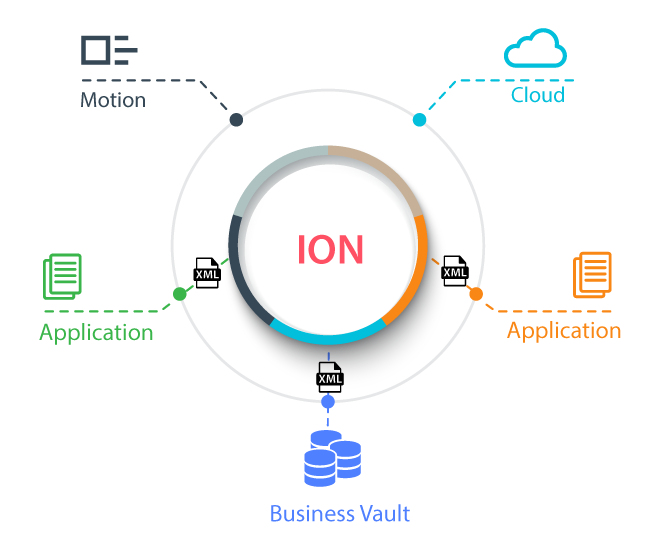 Communicating a new order from the source order entry application to all other applications that need to know about that order is a typical use case for ION. 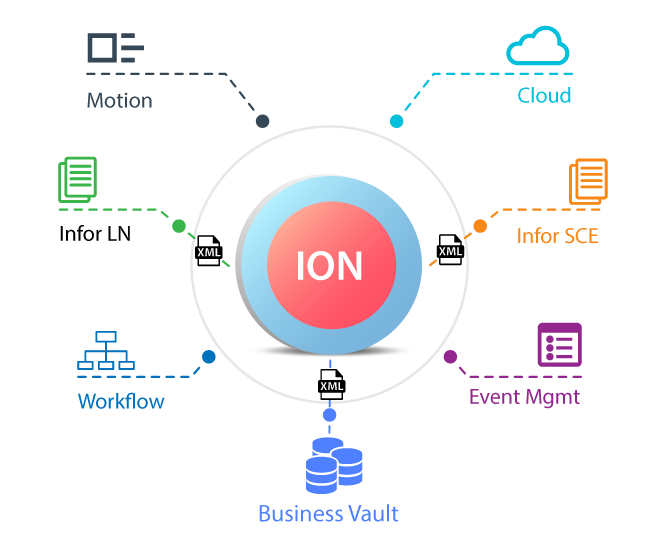 The creation of an order in an ERP application would trigger the creation of an XML document, which is put on the ION service bus. The service bus then routes that sales order to all subscribing applications interested in the order, such as warehouse management, supply chain, or a third-party app. The order entry application, which is the publisher in this example, converts the order to XML format and eliminates the need for the middle ware to transform the message to some alternative, proprietary format. The publishing application has the most knowledge of its own data model and is in the best position to do the conversion. The subscribing application knows the sales order is coming in the same standard XML format, no matter which application published it. If the publishing application changes its data model or APIs, the subscribing warehouse application is not affected, since it only needs to get the same standard XML document it always receives. The sales order would look the same regardless of whether it came from an ERP system. a call center application, Infor’s Rhythm Ecommerce service, or a third-party partner application. A sales order is the same XML format in every context, which simplifies communication. Instead of each application talking a different language, Infor uses industry-standard XML documents based on UN/CEFACT core components (eg.OAGIS) for all applications. It’s analogous to the enlightening moment when a country decides to speak one language for the sake of efficiency. A copy of the XML document is also routed to a central repository called the Business Vault. The Business Vault, a real-time data mart, is the underpinning of real-time big data that can be used for business intelligence and is one more subscriber to the document. The Business Vault is a universal repository with many use cases in the Infor Architecture. The data is available in real time for in-context business intelligence in the presentation layer. Other subscribing applications, whether in the cloud or on-premises, get the same sales order in the same XML format. A subscribing application could be a third-party application like Salesforce.com, a mobile application, or a sales dashboard.